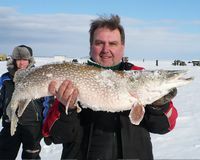 Northern Pike (Jackfish) Fishing on Lake of the Woods, ZONE 5, is open all year round. Northerns average between 5 and 10 lbs, however there are many much larger. For example, a 30 lb Northern is not out of reach. 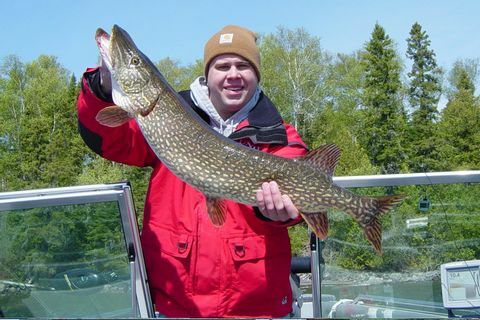 Lake of the Woods is a top Northern Pike fishing destination that can provide you access to the best Northern Pike fishing anywhere in Ontario. 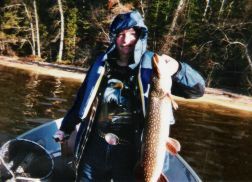 Northern Pike (Jackfish): Fun to Catch! Whether it’s a trophy fish you’re after, or you just want to catch and release, we can help you find that perfect fishing spot. The Master Angler Award program recognizes the efforts of fishermen catching Northern Pike 30" and over. Here in Zone 5 - For Residents & Non-residents - the Northern Pike limit with a full Sport license is 4 a day and 4 in possession (over 2 days or to take home). With a conservation license the Northern Pike fishing limits are two a day and two in possession. You can only keep Northern Pike under 29.5 inches long. 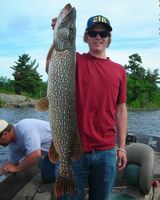 Receive a Master Angler Award for all Northern Pike 30" and over.